If you would like to do some yoga at Iguana Lodge – feel free to enjoy our fab facilities – or practice with Lauren, our on-site yogini. Beach Yoga… or not. Iguana Lodge has two fantastic studios, and Lauren can lead you in her playful, practice consisting of an athletic, balance oriented vinyasa which she enjoys envisioning currently as somewhat tai-chi-esque – moving carefully, thoughtfully, choicely aligned; flowing through the cosmic goo (viscosity similar to Tupelo honey – stretching among other things, connective tissue). Hah! (She has a lot of time on her hands.) No experience required; inspired by Divine Movement, and Shiva Rae, Duncan Wong, Simon Park, Cameron Shayne of Budokan, Tracy Mohr, Kim Crotty, Sabina Stahl, Amy Sullivan “Sully” – “Miss March” Yoga Journal, 2013), Trisha McBridge, Theresa Paraskos, Kari Jacobsen, Emily Phillips, Amy Leydon, Matt Giordano, Dancin’ Becka, Kyle Weiger, Shira Yaziv, Michelle Plante, Alyssa Dizoglio, Marco Rojas, Kenny Graham, Michelle Marchildon, Julie Giordano, Dawnelle Arthur, etc, etc, etc. Namaste! (Or as Kenny likes to say, “Pura Vida!”) . Here’s a video of Lauren’s yoga. Lauren’s class is complimentary and generally offered a few times a week. The class can vary in length from 30 to 60 minutes, depending upon Lauren’s whim and capricious schedule. 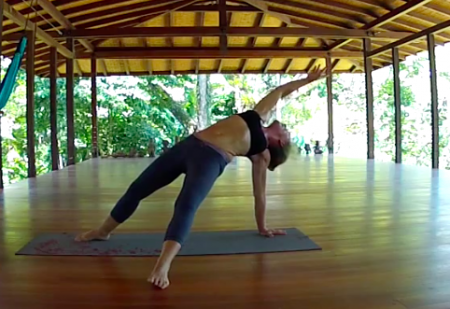 Iguana Lodge also offers classes for a fee that can be arranged around your schedule, employing one of several other yoga teachers in the area. Some people find Lauren’s class not to their liking: it’s quite athletic with a lot of arm balances and tricky moves. So, again, we can arrange another teacher for you for a fee – no problema. Meanwhile, we also host marvelous yoga retreats with famous and infamous yogic masters. Often yoga is available on a daily basis to Iguana Lodge guests with the retreats.